My Garmin data. I think the elevation is wrong! Here we go again – around and around and around! And around. And how appropriate that this is also my 100th blog post! 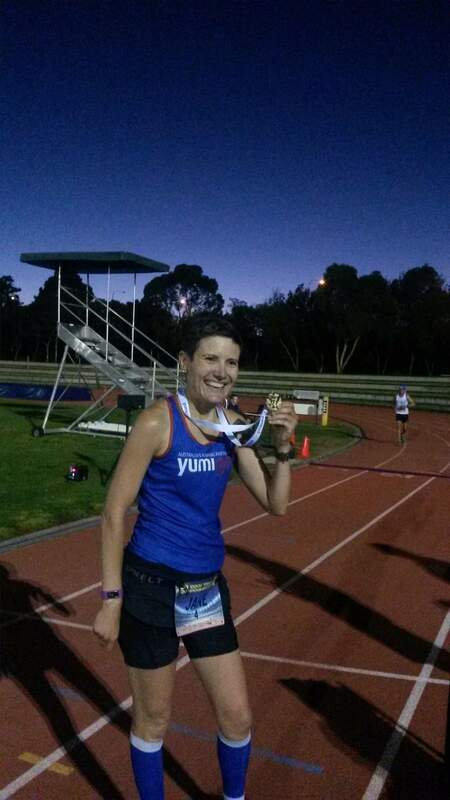 Last year I ran in the inaugural Yumigo 100km state championships. You can read all about it here. 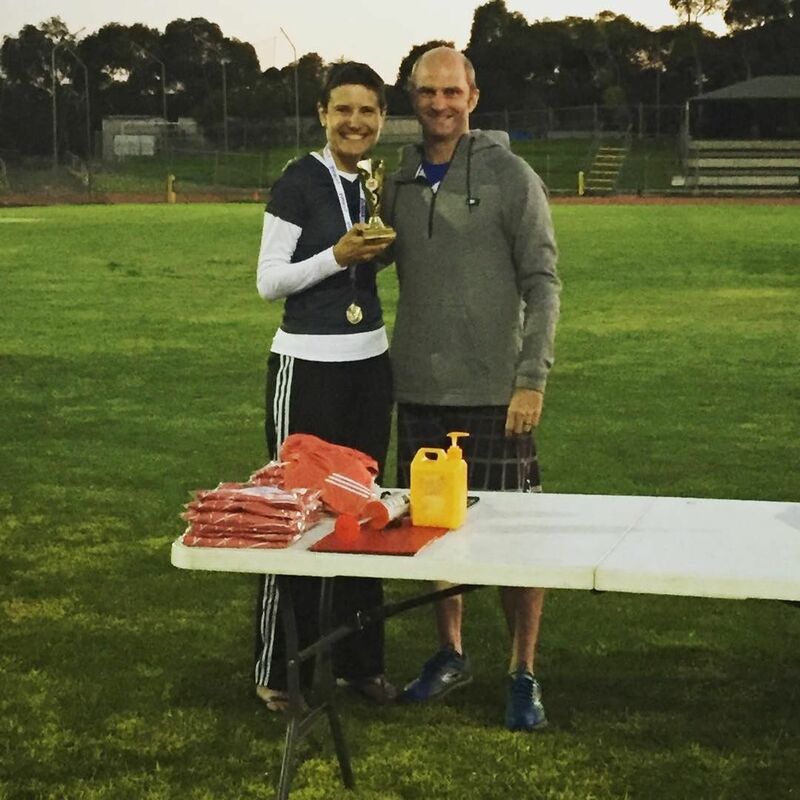 I remember distinctly, immediately after the race, when race director Ben announced that it would be run again this year, fellow competitor Karen and I looked at each other and said “Never again!” (I was reminded twice of this in the past few days – by my mum and by friend Maree). And yet, here we were again! 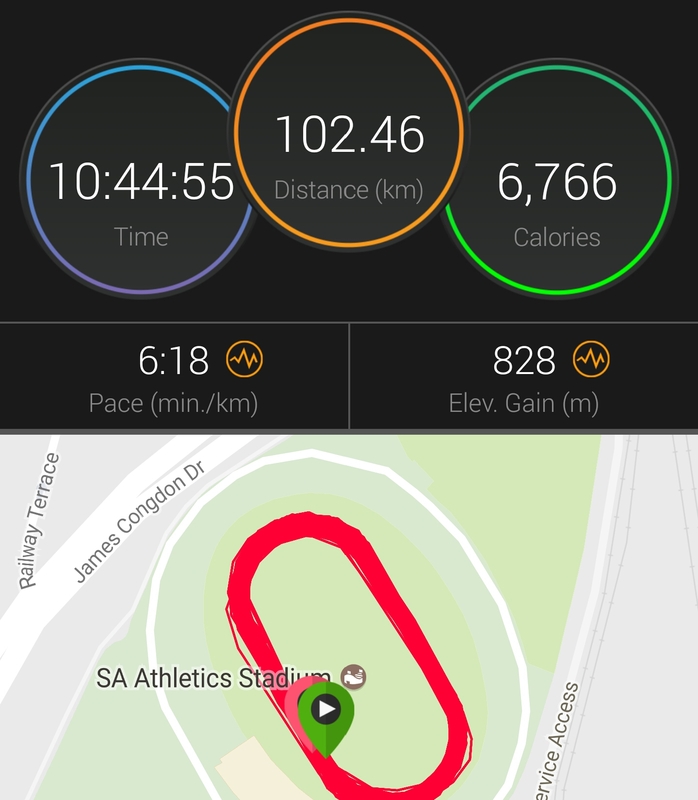 After a 30k long run the previous Saturday which was very evenly paced, I had 2 runs during the week, both slower than usual – perfect preparation for a 100k ultra! I did go out and run a parkrun with Mum on Saturday morning but there was a fair bit of walking. Nutrition-wise I went with 3 sandwiches (some peanut butter and some coconut spread – it’s always good to have a bit of variety because you never know what you’re going to feel like eating! ), some almonds, 3 nut bars and some mashed sweet potato with a little salt. In the process of peeling the sweet potato with my awesome Y-peeler I discovered that the peeler is also very good at peeling human flesh! Last year I’d made up a big container of Gatorade but I remembered it was a bit of a hassle pouring it into the cup. This year I decided to fill up 6 bottles which I could then pick up and run with. As per last year, I had lunch for breakfast, dinner for lunch and breakfast for dinner! 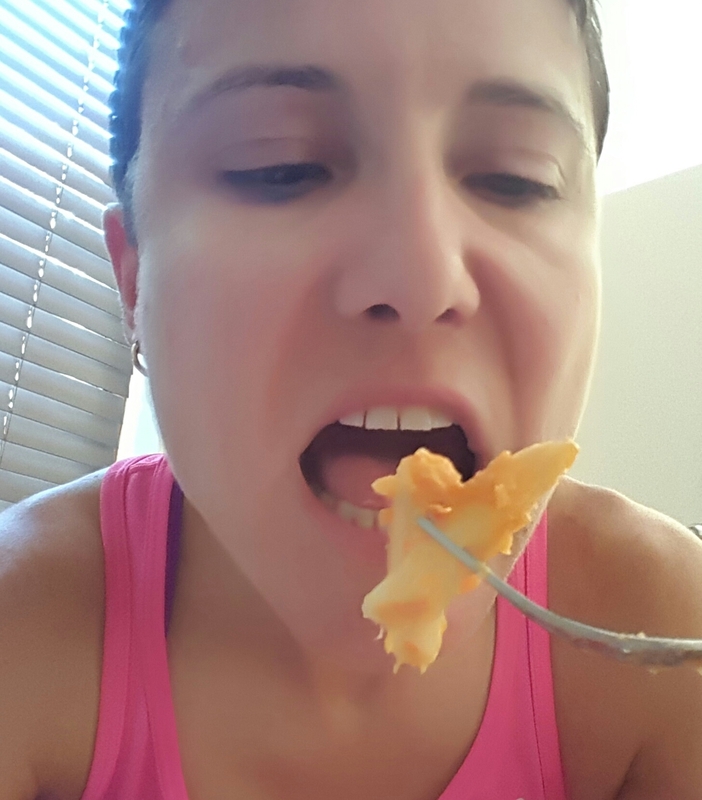 Breakfast was peanut butter on toast, lunch was sweet potato mac and “cheese” (recipe here) and dinner was a smoothie. Carbing up like a BOSS! I had a few hours’ nap in the afternoon as I was going to be running all through the night. Gear-wise I had my usual Skins shorts with my black lulu skirt over the top. I went with blue calf sleeves, a pair of road shoes (the same ones I normally wear but half a size bigger to minimise blisters) and my Steigen socks (guaranteed blister-proof!). I started with a (newish) Mekong top, it was a Yumigo one which seemed appropriate given it was a Yumigo event! I thought it was pretty safe though, even though I’d only run in it once before – in this kind of event there’s always the opportunity to change tops if it isn’t comfortable. I packed a few extra singlets, some arm warmers and a long sleeved top in case it got cold during the night – although that didn’t look likely. We started at 7, an hour earlier than last year, so it was pretty warm when we started. I think someone said it was 29 degrees at the start and still quite sunny. Consequently I started the race with a hat and sunnies, and with sunscreen on, but the good thing was that I would not need to reapply the sunscreen! There were 12 starters in the 100k and I think 15 in the 50k. This year, the 100k and 50k runners were separated – we had lanes 1-3 and they had lanes 4-6. While last year the 50k runners had done 125 laps, this year the number of laps was calculated based on the slightly longer length of lap in lane 4, and consequently they started at a different point on the track (but at the same time) so they would still finish on the finish line. 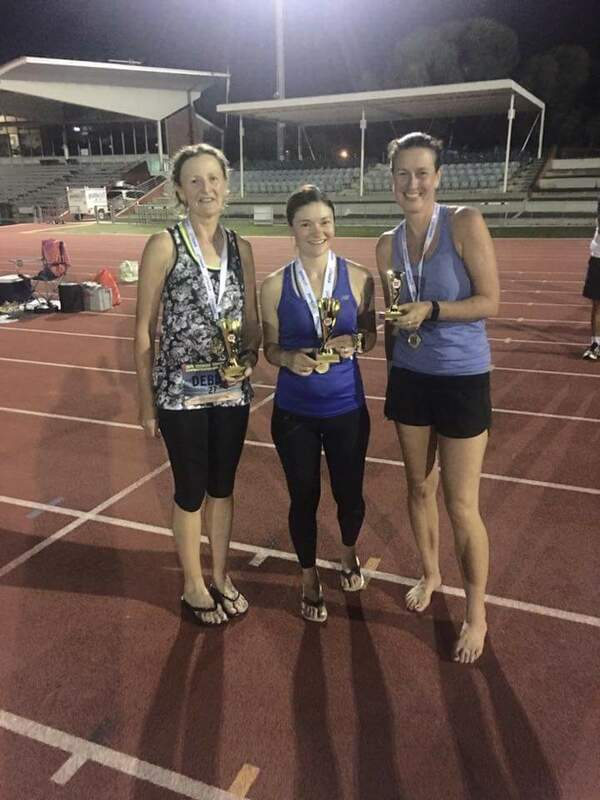 There were only 3 women in the 100k which meant that we only needed to finish to get a podium position! ONLY needed to finish – I probably shouldn’t use the word ‘only’ there. Last year, out of 12 starters, there were only 5 finishers. 2 more runners ran for the full 12 hours but did not manage to complete the 100k, and possibly some of the ones who dropped out, did so because they knew they wouldn’t make the time cutoff. The last official finisher was averaging 7:10 min/km and only JUST made it. Compare that to trail events of the same distance like UTA100 (28 hours) and Heysen 105 (25 hours). Sure, those events are COMPLETELY different, with lots of elevation, but running 100km on a flat track is not necessarily easier! 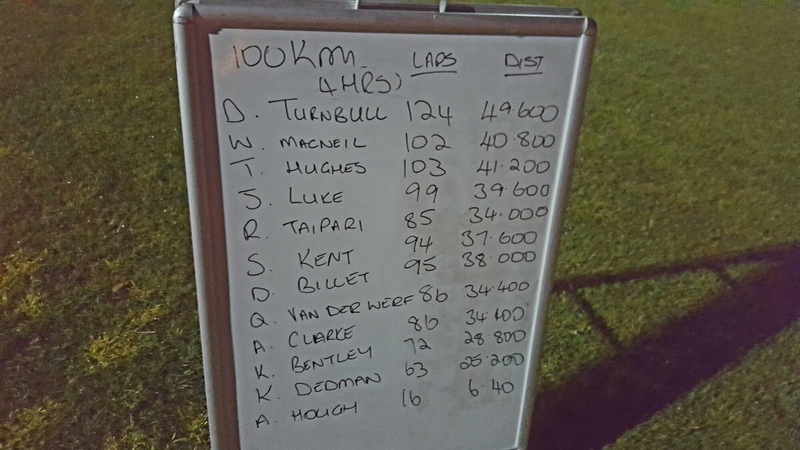 There were a few things happening to break up the monotony (I use the term ‘monotony’ in the nicest possible way) – every hour or so the whiteboard near the start/finish line was updated to show each runner’s current lap count, and every 3 hours we got to turn around! I did very much look forward to that, although it did feel quite weird running anticlockwise! One of the hourly updates! My strategy was simple. Run 30 minutes, walk 5 minutes. It was the same strategy I’d started with last year, but over the course of the night the “run” sections became shorter and shorter, but I never allowed myself to walk for more than 5 minutes at a time. Last year I’d put an alert on my watch to remind me every time it was time to walk (or start running again) but this quickly drained the battery, and I knew that watch wouldn’t last the distance anyway, plus once I’d changed the run/walk intervals, the watch alerts were useless. So I decided to keep track of it in my head! As there were only 12 runners in the 100k, I got to interact a bit with all of them – either as I passed them, or as they lapped me with monotonous regularity! I was running with one of the 100k runners, Stephan, at (I think) around the 5 hour mark and was surprised when he told me he hadn’t walked at all up to that point! I guess the run/walk strategy isn’t for everyone, but it certainly works for me over this distance. Even the super fast runners were walking at times (eventual 100k winner David T and 2nd placegetter in the 50k Simon). I managed to keep the 30/5 intervals going until 3½ hours, which seemed like a logical point to change to 25/5 – much easier to keep track! It worked out well with the stadium clock too, because the race had started at 7:05, so the idea was that on the half hour and on the hour (by the clock), I would walk for 5 minutes. During the walk breaks I would take in nutrition and grab one of my drink bottles. Over the course of the night I only had one lot of sweet potato – maybe about ¼ cup or maybe even less than that – and didn’t fancy it after that. I didn’t touch the almonds, I just existed on sandwiches, nut bars, Gatorade and Coke. When walking, I started walking on the line between Lane 1 and Lane 2. I got the idea from Kaven, one of the 100k runners who was walking a fair bit and eventually pulled out due to injury – it meant that the faster runners could pass on the left, thereby running the shortest possible distance. At walking pace, it wouldn’t make much difference to the distance I would cover. When running, I’d stay as close to the inside of the track as possible – so when I went from ‘walk’ to ‘run’ I’d drift back across to the inside (after checking of course that DT wasn’t about to fly past me – he was a man on a mission! The singing started early this year, and surprisingly it wasn’t me who started it! And Michelle, who had started it last year, wasn’t running this year. She was volunteering and was there at the start but didn’t stay the whole night. And I wondered why it seemed quiet! This time it was Karen who started the singing – she had her iPod going within the first hour I think! I was saving mine for after the halfway point (after the 6 hour turnaround) – I didn’t want to get too reliant on it, and it would be later in the night, as 50k and some of the faster 100k runners finished, that it would be needed – less people out on the track to chat to, and less spectators! 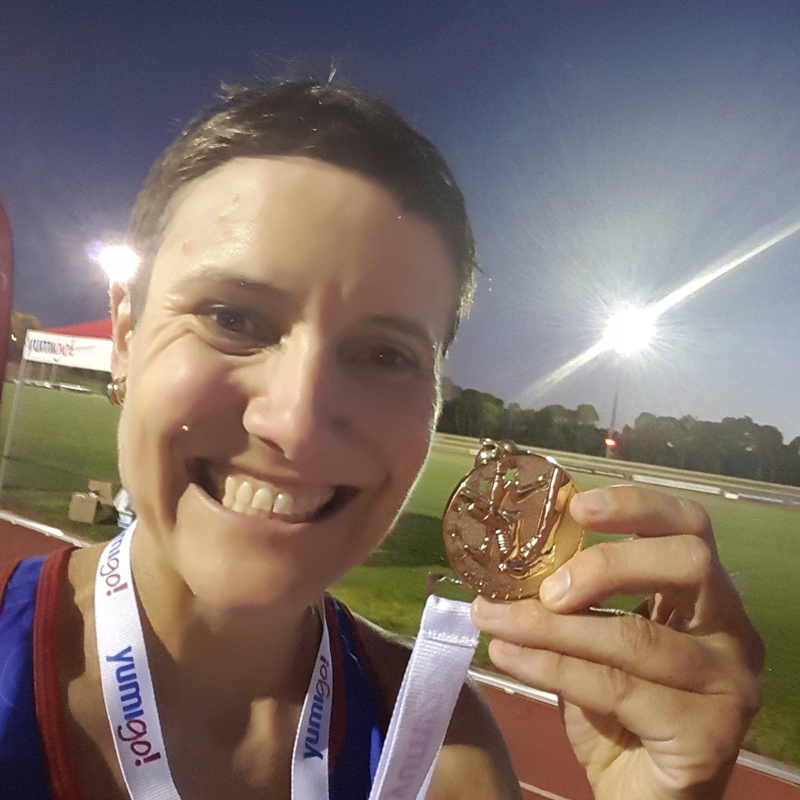 As there were only 3 women in the 100k race, and Karen had already said she didn’t think she had a hope of reaching the 100k, and Bec wasn’t confident at all either, I expected I would probably be mainly ‘competing’ with myself, although I wouldn’t count Bec out – she had won the 12 hour race in July and had cracked the 100km on that day. I was confident I would make the distance, I wasn’t expecting to beat last year’s time of 10:43:14 but hoped to do something similar. Anything under 11 hours would be good! I’m not sure exactly what point it was, but I think it was somewhere around 3 hours, I passed Bec and she said she was already up to run 1 lap/walk 1 lap so at that point she knew 100k was not going to happen – but she was determined to keep going for the 12 hours regardless! So effectively that meant that, out of the females, it was only me left! Team Vegan. Who ate all the pizza? Even though there was a bit of physical separation between us this year, it was still great to have the 50k runners out there! I went back and forth with Graham for a while – he kept commenting on how my laps were shorter (which of course they were) whenever I passed him! Graham was the first person to tell me about running around in circles for a ridiculously long period of time (he was referring to the 24 hour race at the Uni Loop, and I recall telling him that sounded incredibly boring!) so I guess he’s to blame for all of this! From the 4 hour mark, the 50k runners started approaching the end of their race, the track getting quieter and quieter with each finisher! 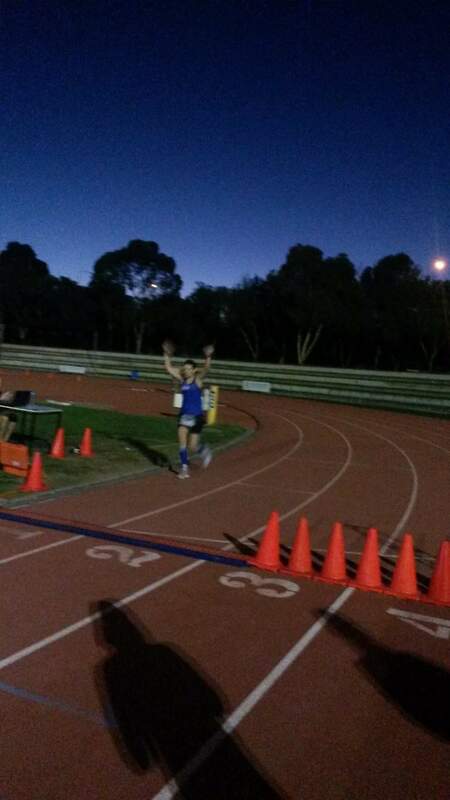 The first male finisher was Randell in just over 4 hours – absolutely phenomenal! Not far behind him in second place was Simon who had also finished second last year. Brenton was third in under 5 hours. The female winner in the 50k was Estha, followed by Debbie and Sheena. 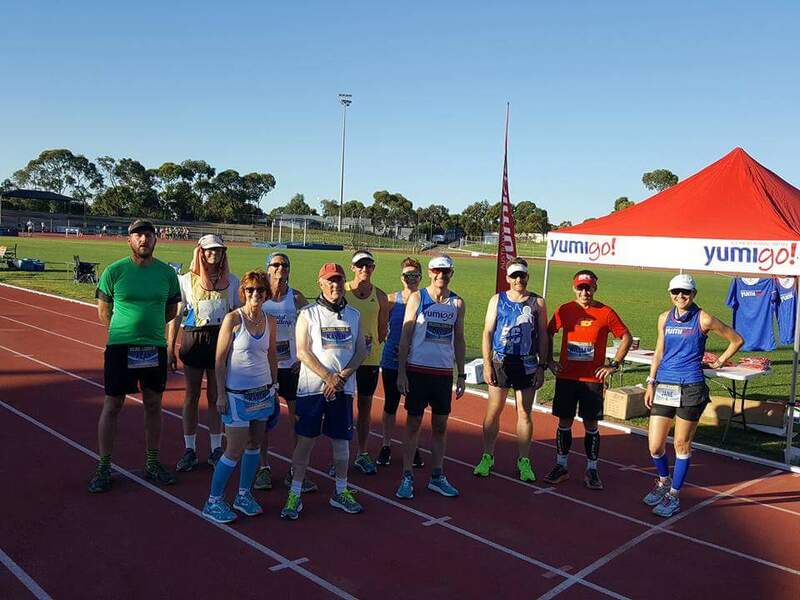 As each of the runners approached the end of their race, Ben announced over the PA system that they were on their final lap – it was really great to see everyone finishing even though we knew the finish was a LOOONG way off for us! It was a welcome distraction and very motivating! The top 3 women in the 50km – Debbie, Estha and Sheena! There were many visitors throughout the night – I won’t be able to mention them all, and there are probably some who were there and I didn’t even realise it! I will just mention a few but all the support from everyone was much appreciated! First there was Liz who was there probably around the 4-5 hour mark and told me to run more upright as I was tending to lean forward (of course I didn’t realise it, but as soon as I corrected my posture it instantly felt better!). As it’s pretty impossible to be thinking about posture constantly for 250 laps, she suggested that I think about it every time I crossed the finish line. And you know what? I think that really helped! Not long after that, Scuba arrived to cheer us on for a while and i do believe he said he’s going to join in the fun next year! Then, probably around midnightish, Tracie popped in on her way home from a night out (oh yeah that’s right. It was Saturday night. That’s what NORMAL people do on a Saturday night!) and stayed for an hour or so? Maybe more? It’s hard to keep track of time! She sat in my chair and got me stuff out of my esky as I asked for it. So this is what it’s like having a support crew! Actually I managed pretty well on my own – it’s the type of event that is quite easy without a crew – but it was nice to have the support for that time! Not long after Tracie left, the next turnaround marked the halfway point, time-wise anyway. At this stage I was on 58km so a finish within the cutoff time was looking comfortable. Although, I was somewhat slower than last year when I sat on 6 minute kilometre pace until about 65km. This time, by the 4 hour mark I had just fallen off 6 minute pace. Still, it was considerably hotter than last year, and I’d also managed to keep the 25/5 intervals going. And I was only marginally off pace so I wasn’t concerned. This was also the point where I got the iPod out. I had planned to sing “Total Eclipse of the Heart” when we turned around (“Turn around…” – seemed appropriate!) but forgot! (Pretty sure that song did eventually come on!) I think from memory the first song was “We Like To Party” by the Vengaboys! Throughout the rest of the night I had the iPod on and off – the earbuds kept falling out so it was a bit annoying – must get some decent ones for next year (YES I did just say ‘next year’!). I had difficulty hitting the high notes when running (probably not surprisingly!) but I think the highlight for me was when Mariah Carey’s ‘Hero’ came on. That, very conveniently, coincided with a walk break, so I was able to give it a good crack! I thought the lyrics were pretty apt too! Hope everyone enjoyed it! I tried to limit the loud singing to when I was on the straight in front of the grandstand, where all the spectators and supporters were. I thought they would probably appreciate it more than the other runners, and of course I had to conserve some air for breathing! Also I had to pick my battles – for example, Beyoncé’s ‘Single Ladies’ is a great song to listen to and dance to but VERY hard to sing especially while running! At the 7 hour mark I had 2 Voltaren (I know – anti-inflammatories – bad – but I’d done the same last year and it had worked well!) and an energy drink. From about the 2 hour mark onwards, I was mostly 3 laps behind Toby, who was in 2nd place overall behind DT. At one point I had closed the gap to 2 laps, and at one point it had blown out to 4 laps, but 3 laps seemed to be the order of the night! I thought at one stage I might be able to catch up a lap or two or even get ahead of him, but he just seemed to get stronger as the night went on and although I was running well, I wasn’t able to make up any ground! Karen and Bec were still going and in good spirits. At one point Bec went FLYING past me and soon after that, was walking again. This would have been at least 8 hours in – she joked that she was doing interval training! She said that was the only way she could run, and she would cover more ground this way than by just walking! Around 8 hours 42 the first of the 100k runners, DT, finished! I think it was a tough day at the office for him, and as I said he was walking at times, but it was still a phenomenal performance! As I passed other runners, or as they passed me, I’d mostly call out encouragement (if I didn’t it was because I was concentrating on breathing or possibly singing!) but David looked so focused most of the time I stopped calling out to him! Plus he passed me so many times I would have used up all my energy! Probably around the same time I cracked the 80km barrier (just goes to show how good DT is!) and that meant I had ‘only’ 50 laps left. I didn’t want to count laps and I had consciously avoided thinking in those terms, but I did get caught up in counting for a few laps after this! These type of events result in notoriously inaccurate GPS recordings. Last year my Garmin showed I’d done over 102km. So, while initially I was going by my watch to work out how far I’d gone, I realised that I could only really rely on the hourly whiteboard updates, and if there was anyone standing by the computer as I went past the start/finish, I could ask them for an up-to-date lap count. I preferred not to know the exact laps though – all that mattered was, I would DEFINITELY know when I was on my last lap! I worked out that my Garmin was about 2km out so I used that as a rough estimate. Then there was a quiet period, broken up by Cathie finishing her 50k with an unbelievable sprint finish! At the 10 hour mark I was on 232 laps – still 3 behind Toby! And most pleasingly, while by the end of last year’s event I was down to 7 min/3 min walk/run intervals, I had managed to keep the 25/5 intervals going right from the 3.5 hour mark to the 10 hour mark! So, with 18 laps to go (7.2km) I decided that by the time I got to my next scheduled walk break, I would be so close to the end I would be best to just keep going – and so I did! No more walk breaks! That last 45 minutes went pretty quickly! I knew Toby would still be 3 laps ahead of me so I was just hanging out for his last lap to be announced! Then, I would be only just over 1km away from being done! Still with my iPod in, Adam, who was in charge of the timing, informed me that I had 5 laps to go! I said, “5 laps? That, I can do!” and set to work getting it done! I left my iPod on my chair, and got down to business! That last 5 laps was a bit of a blur! First, I got to watch Toby finish (I moved onto the line so he could pass on my inside – I’m sure he wouldn’t have wanted to go around me when he was so close to the end!) and then it was nearly time for me! 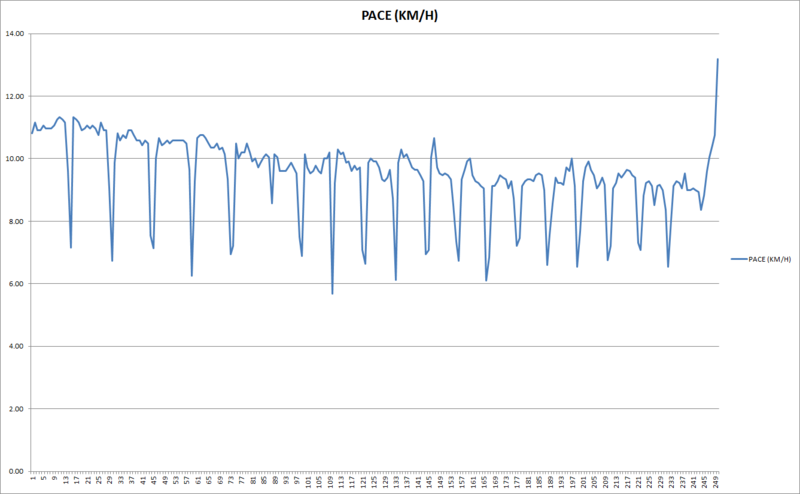 My EXTREMELY nerdy chart showing every one of my 250 lap splits! I crossed the line in 10:44:51 – just marginally slower than last year (under 2 minutes) but I was in a much better state at the end and I was so pleased with my consistency! Some well-earned bling right there! First order of business – shoes OFF! As I walked past Toby who already had his shoes off, he said he’d been thinking about taking them off since the start of the race! I had said to first aider Susan as I ran past her late in the race that I didn’t think I had any blisters (unlike last year) so I wasn’t expecting any nasty surprises! My feet looked surprisingly not terrible for having just done 100km ( I won’t say ‘good’ – as they never look ‘good’!). I went back to the start line to see David B, 3rd placed male and the last of the 100km finishers, complete his race. I didn’t realise he was so close, he was only about as far behind me as I was behind Toby. He told me afterwards that he thought he would catch me! With Ben at the trophy presentation! Then it was time to change into some warmer clothes and eat the rest of my food! As it turned out I only ate 2 sandwiches and 3 nut bars (plus that little bit of sweet potato) throughout the race so that left me a whole sandwich to eat while I waited for the end of the 12 hours. 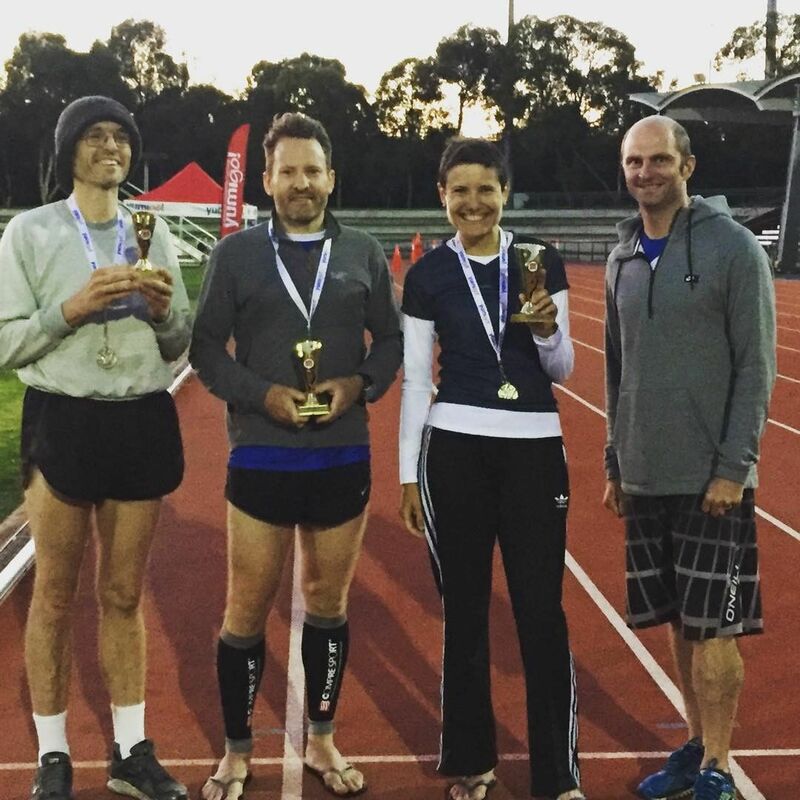 The only 3 runners left were Karen, Bec and Stephan, who didn’t quite make the distance but did keep going for the full 12 hours. I chatted with 2 of the other 100k runners who had pulled the pin early but were still at the stadium – Quinten and Alan. 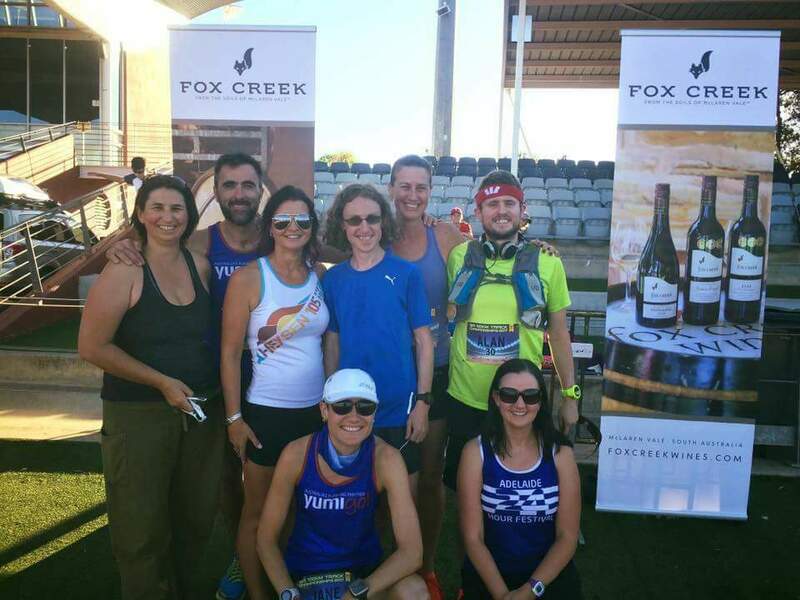 They had run together the whole way but were thrown by a big inaccuracy in the Garmin – their watches were showing they were on 56km when they were in fact only at 50! And that being at the 6 hour mark, it would have been an uphill battle to finish under cutoff time (I imagine it would be VERY difficult to negative-split a 100km ultra!). I saw them a number of times as we went around, and despite not getting the result they would have wanted, they said that they did enjoy it! And before too long, the air horn was sounded to signify the end of the event. Karen, Bec and Stephan were all still standing at the end! Bec said “Never again” (or words to that effect) and Karen said “maybe the 50k”. I said nothing! As is now ‘traditional’, Karen and I then went to her gym for a lovely hot spa, interspersed with a dip in the plunge pool, and finishing (as recommended by first aider Susan) with the cold plunge pool! Aaand… not so much! But we were both glad we did it! Sunday night I slept in my compression pants despite it being a pretty hot night, and on Monday my legs felt surprisingly OK! So, that just about wraps up another fantastic event! But I can’t end without thanking some people. Firstly to the supporters, it was great to see you out there especially through the night – I gather it was pretty chilly standing around, as many of you were wrapped in blankets! I can imagine it might be a bit boring watching people run and walk around in circles, so thanks for being there! To my fellow competitors, thanks for all the support and encouragement out there, and for putting up with my singing! Well done to all of you, whether the night went to plan for you or not. 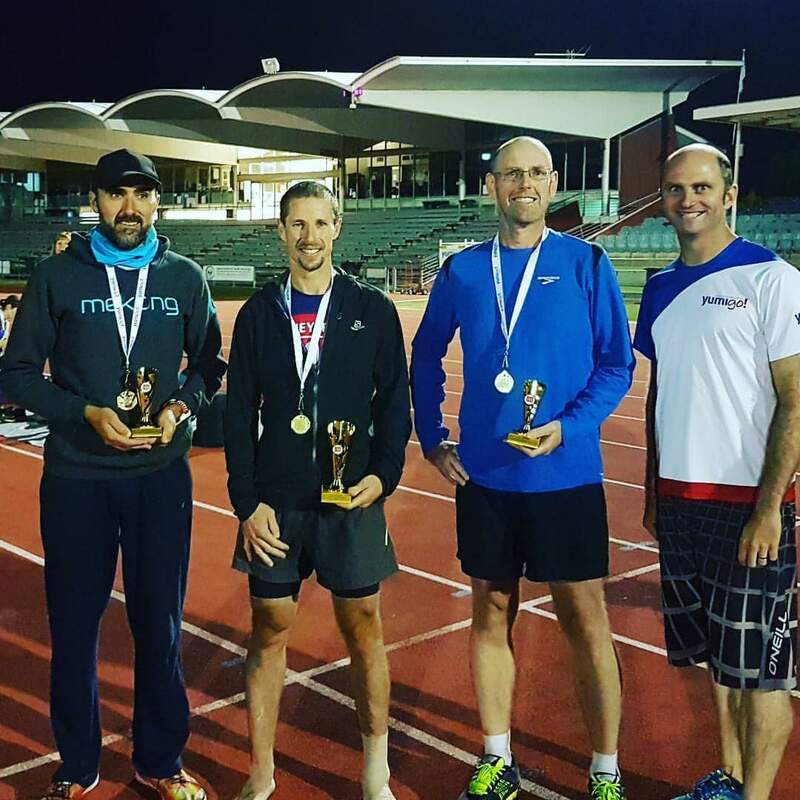 Just turning up to run 50k or 100k on a track on a Saturday night is worthy of kudos! To Adam for the awesome job on the timing, and to Susan and the First In Sport First Aid team who are always there and always appreciated, especially when their services are NOT required! And last but not least to Ben, who I am convinced must have cloned himself to be able to do all the things he does to put on these fantastic events (either that or he doesn’t require sleep!) Once again, another Yumigo triumph – a very professionally organised and (I can’t believe I’m about to say this) highly enjoyable event! Thanks Ben for all you do and good luck for your next big event! Aaaaaand I guess I’ll be back next year!